… It turns out that Exeter University spawned yet another fascinating prog offering: Principal Edwards Magic Theatre. Forming a little earlier than Fuchsia, this band moved to Kettering, Northamptonshire, in their early years. Astonishingly, I have links to Kettering too, as my brother did his year in industry there. Having actually visited Kettering, it seems ludicrous to me that such a drab and dull place could have inspired such inventive and artistic work. PEMT were, at their height, a 14-piece group who delved into costumes and theatrics during their surreal shows. They released two albums (Soundtrack (1969) and The Asmoto Running Band (1971)) on John Peel’s Dandelion label before folding. 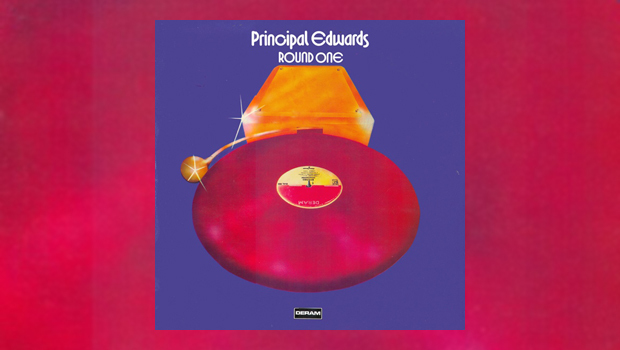 After this, however, a subset of the group decided to continue as a tighter, more compact unit, with a fittingly more compact title: Principal Edwards. The band’s sole album, Round One was recorded on the Deram label, but its title was supposed to be the first of a sequence of names charting the chronological order of the band’s successive albums. Though these didn’t come to fruition, Round One has still left a solid legacy for the band. What is evident, upon popping the disc into your playing device, is that the band have a wry and ever so satirical sense of humour about their lyrics which keeps the tunes fresh and interesting even in the 21st Century. Opener Average Chap speaks unvaryingly about the tedium of commuting to and fro from work, whilst all the while imagining you’re a “comic book hero”; subject matter that’s perhaps not a million miles away from Pete Sinfield’s lyrics for PFM’s Mr. 9 ’till 5. The next two tracks, Halibut Rock and Milk and Honeyland, share a thematic link: post-apocalyptic London, once again all done in a rather light-hearted though black-humorous way. But even though it’d be a stretch to say that the band were truly “prog”, their tunes will not disappoint those who are drawn to the genre. All sorts of odd instruments are used, and there are interesting production choices galore, thanks to Pink Floyd’s Nick Mason at the helm. Just listen to the lengthy suite at the end of the album, whose part titled Lady of Danger includes some very atmospheric work between the bass and the drums. Each track on this album has a song structure that deviates from your regular verse-chorus AOR style, and so Round One never feels samey. It’s only towards the end that the band get really prog, with an instrumental suitably titled Triplets followed of course by the five-part, ten-minute suite The Rise of the Glass-White Gangster. I will say though that the latter seems more like a satirisation of prog – in the same vein of satire as the rest of the album – as it’s all rather silly fun indeed. I wouldn’t say it was necessarily all that good though. Esoteric have once again done a splendid job reissuing this album, with all of the artwork included as well as the lyrics, transcribed from the back of the original LP sleeve. Very handy indeed! Appended to the disc are all of the non-album tracks that popped up on singles the year before the album came out, so this could be said to be a “complete” set of all of Principal Edwards’ official output. For your buck, you also get an extensive essay from Malcolm Dome, who was apparently able to track down many former members of the group for questioning. However, one feels he could have done a better job condensing his interview output, as we essentially get the same sentiment echoed three times for comments regarding Nick Mason as the producer as well as thoughts on the Devon demos that came after the recording of the original album. If you do have the time to read this though, it is very informative. The band themselves admit in the notes that this album didn’t deliver the punch they expected it to, although they put this down to the once rather flat pressing that Deram originally gave it. However, I believe this was also down to the lightweight feel of the album, humorous and poppy, fun and adventurous, when audiences were still seeking a more “serious” journey with their music. It’s a shame that this album was overlooked, as it seemed promising that Principal Edwards could have delivered even better material on a second album.